Warning: this may wind up being one of those cranky, "get off my lawn!" kind of posts, so you may want to come back later in the day (when I'll publish another post) if that sort of thing bothers you. 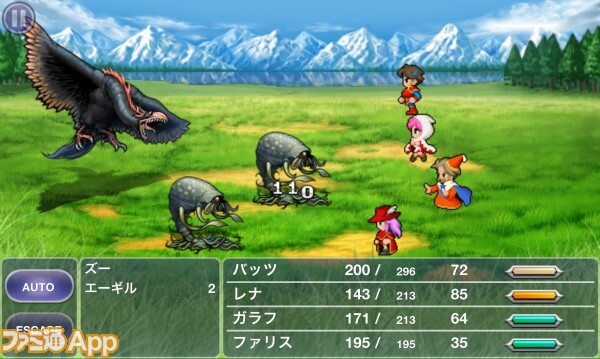 For the rest of you: a few days ago, the folks at Square Enix finally pulled back the proverbial curtain on the iOS (and, eventually, Android) remake of Final Fantasy V that they announced late last year. Specifically, they released a number of screenshots of this re-imagining, one of which can be seen below. Sadly, it seems Square Enix's designers once again are employing the rather generic art style they used while developing the Final Fantasy I, II and IV remakes that were released for the PSP over the last few years. That's not to suggest I hate everything about the screenshot seen above (or the one below, or the others that can be viewed here). In fact, I love that the people behind this version have decided to add character portraits to the game's dialogue scenes. Also, I have to admit that the menus in this release look quite a bit better than those found in, say, last year's Final Fantasy Dimensions. Oh, and for some strange reason I'm finding myself oddly attracted to the Lenna-as-White-Mage sprite included in the screen below. Other than that, though, I'm feeling pretty let down by this particular remake, which will hit the Japanese App Store on March 28 for 1,800 yen (about $19--it'll hit the equivalent Android shop sometime this summer). The character sprites--Bartz/Butz, especially--make me want to yawn, while the enemies and backdrops appear to have been pulled right out of this title's GameBoy Advance counterpart. Of course, you're looking at a guy who'd rather play the original Super Famicom version of Final Fantasy V than any gussied-up remake--unless said remake was made for the 3DS using the Bravely Default engine (ahem)--so maybe you should take my grumblings with a grain of salt. That's just my opinion on the matter, though. What do all of you think? This is simply awful, there is no other word. Don't apologize for having standards. Most people don't, and because of that we have tons of "HD remakes" that could be more aptly described as "questionable emulation with grotesquely ugly smoothing filters", but people still get excited because they don't know any better. This game at least has some "new" art, but that's not much help. 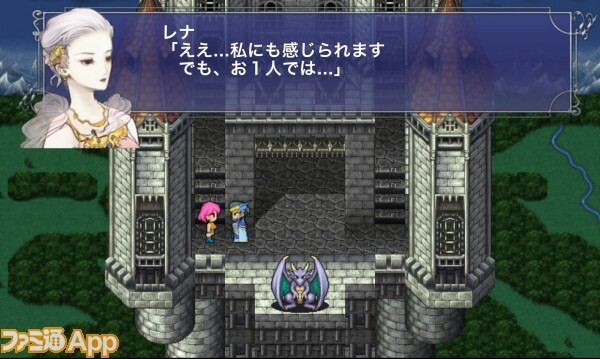 Those character sprites look fairly terrible and they still look nothing like the Amano portraits. I have no idea who's supposed to be talking in any of those dialogue screenshots! Seriously, I love that there are others out there who aren't fans of these remakes. Unfortunately, I have a feeling that, as they are with the Final Fantasy XIII "series," SE is going to keep pumping them out for a bit despite the fact that lots of gamers are horrified by them. Thanks, Josef :) Oh, and I completely agree with you RE: all of the HD "remakes" that are being dumped onto the masses these days. Yuck. Personally, I'll pretty much always take the original versions in this kind of case. It helps, of course, that I've always like the aesthetics of the original versions of Final Fantasy IV, V and VI (although I also quite like the GBA "remakes"). Even if I didn't, though, I'd be looking for something far more interesting than what we're seeing here. I like the idea of remaking FFV. I like the idea of it being readily available. But I HATE the art direction. Hate it. The characters are devoid of charm. They should have stuck with the FF:ATB sprites. Blargh. BTW, what's your current thinking RE: FF: ATB? Did you enjoy it? Was it a waste of time and money? Something else entirely? On an unrelated note, I've been playing Monster Hunter 3 Unlimited. Seems they've rebalanced the early game and softened the learning curve a bit to reduce the intimidation factor. I also bought that Monster Hunter Beginner's Guide and I would definitely recommend it. I learned quite a few things I didn't pick up while playing Tri. You're playing the 3DS version, right? Also, thanks for the recommendation of the MH Beginner's Guide. I really liked what I've seen of it, so knowing that it's helpful/useful is great. I bought both versions, but I spent the first 8-9 hours playing on the 3DS while waiting for Capcom to release the transfer app. The camera lock they added greatly compensates for the lack of a second analog stick on the 3DS, but I'm importing a Circle Pad Pro XL to keep the controls more consistent between the two versions. Oh! That's cool. Are the 3DS and Wii U versions basically the same--except for the Wii U's HD graphics and online multiplayer, I mean? Also, I'm surprised to hear the Circle Pad Pro XL wasn't released alongside MH3U here. Is it supposed to come out at some point or are they passing on it? Correct, Other than onlne and HD they are identical. As for the CPP, I'm not sure if there are any plans to bring it here. The tracker says mine should arrive tomorrow, so I'm eager to try it out. Thanks, Justin :) So, I'm guessing it's a game you don't play for all that long? Never played FFV. Not sure if it ever came out here officially, though I may have seen the GBA version floating around back when it came out. Having a look at the screenshots you linked from famitsu - is the character art based on Voldemort or something? (no noses in the side profile pics) just makes them look weird. I don't think I want to support SE in their "mobile" endeavour. It just reeks of cash grab (that's my cynicism speaking). You've never played FFV? Do you like Final Fantasy and RPGs in general? If so, I'd highly recommend playing some version of it--with the GBA port/update being the best, IMO. The only versions of FFV that were officially released in the west, BTW, were the PSone and GBA ports (as far as I'm aware). The PSone version is a straight-up port that's been translated, while the GBA has new background graphics and additional content. I own both FF and FF2 on iOS. I like their improved graphics and refinishing, but the buttonless gameplay and the small screen size were a big minus for me. I don't think I'll be playing any more RPGs on iOS anymore. I enjoyed FF4 on DS though. I've always wondered how buttonless gameplay would affect an RPG like this one. I thought it would be more acceptable than, say, a buttonless platformer, but I guess it's still kind of unacceptable, eh?